A woman aged 69 years presented with chronic medial knee pain for the past 12 months. Apart from type 2 diabetes mellitus and hypertension, there was no medical history of gout, trauma, endocrine or metabolic disorders. 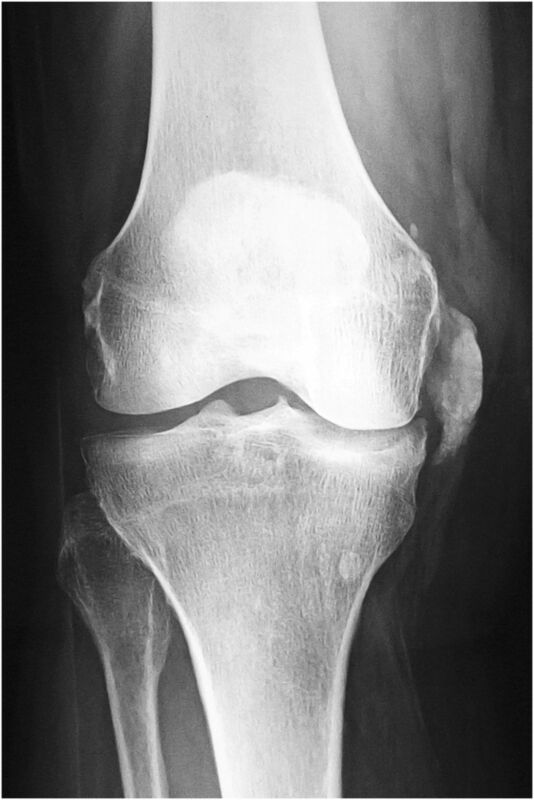 Plain radiographs showed a massive well-defined calcification at the medial side of the knee joint (figure 1). The calcification's upper margin was near the origin of the medial collateral ligament (MCL) and the lower edge was at the level of the medial tibial condyle. Further MRI revealed that the calcification was within the substance of the MCL (figure 2). Osteoarthritis with medial joint space narrowing, osteophytes and degenerative meniscus tear were also present; however, the patient focused her pain along the MCL and not at the femoral or tibial condyle or along the joint line. Full blood count, inflammation markers and calcium levels were within normal limits. The lesion was surgically removed through a small incision over the MCL. Care was taken to protect the ligament's fibres and completely remove the toothpaste-like tophus. Histopathological evaluation showed nodular degeneration with calcium depositions. The patient was relieved from her symptoms immediately postoperatively and remained asymptomatic until the 2 years follow-up. Anterolateral plain radiograph of the right knee showing a massive calcification extending from the origin of the medial collateral ligament to the level of the medial tibial condyle. 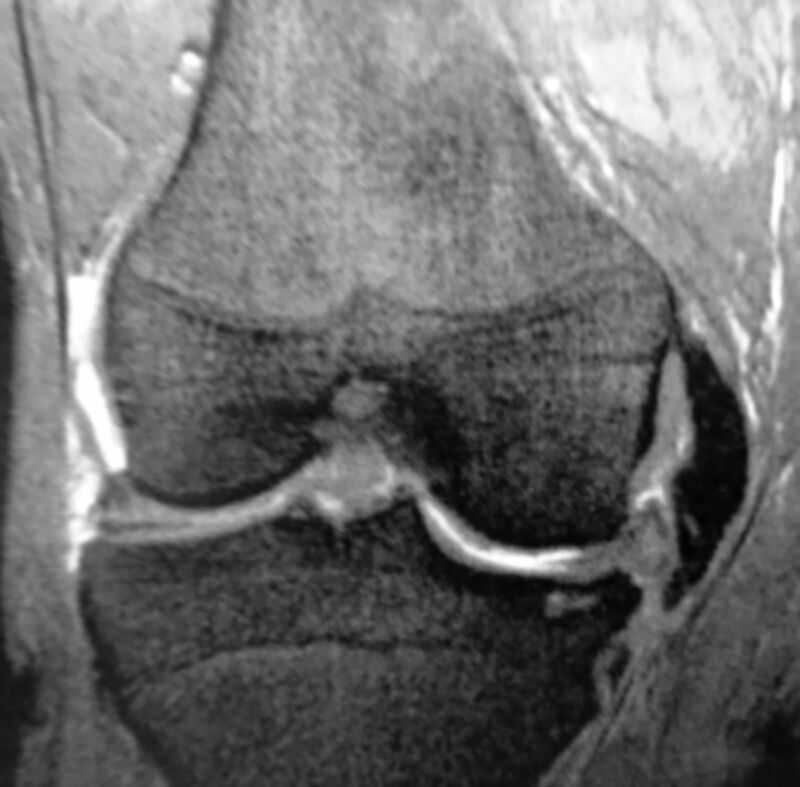 Fat-suppressed T2-weighted coronal MRI of the right knee shows the intraligamentous location of the lesion. Chronic pain located at the medial side of the knee is not always osteoarthritic pain. Thorough clinical and radiological investigation with plain radiographs and MRI in some cases is mandatory. Calcification or ossification of the medical collateral ligament of the knee responds well to conservative treatment. Surgical resection is needed in some cases with larger lesions. Contributors TV and FA wrote the manuscript and reviewed the literature. EG reviewed the manuscript and reviewed the literature. SP is the senior author and corrected the manuscript.